One of the best things about Tuscany is getting lost in the small roads of the territory and discover new hidden gems: beautiful and ancient towns where we can feel a different atmosphere from everywhere else in the world. If you don’t know from where to start, here you’ll find a list of 38 charming small towns that boast the Bandiera Arancione. The “Orange Flag” is the tourism quality mark yearly awarded by the Italian Touring Club and dedicated to small inland villages which are distinguished by landscape conservation, welcoming atmosphere, promotion of cultural heritage, quality of accommodation facilities and good food. These are the top small towns in Tuscany that you should include in your next itinerary around Tuscany. From the western approaches to Anghiari, there is a point in the road where many first time visitors are awestruck as the entire town suddenly pops into view as the car rounds a hairpin bend. Anghiari stands out in the wonderful landscape of Valtiberina which hasn’t been invaded by mass tourism. Barberino Val d’Elsa is a beautiful medieval village located in the Chianti area. 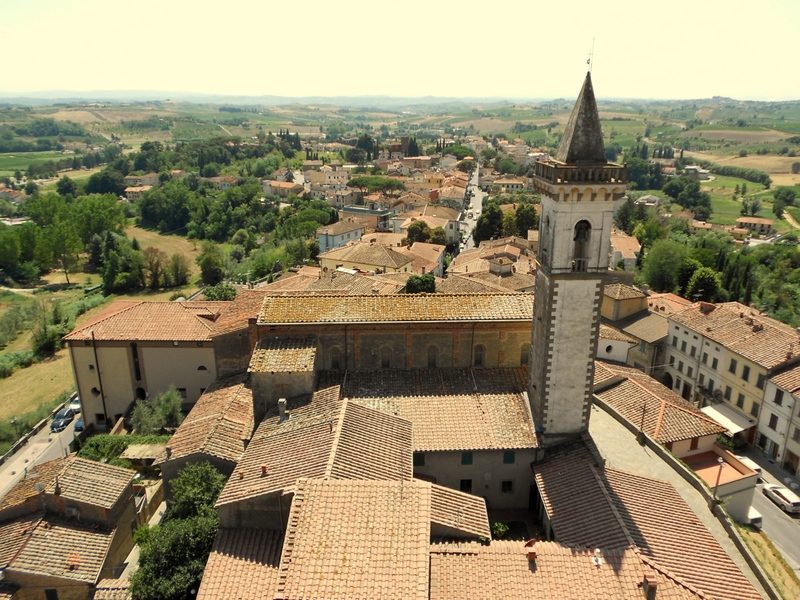 The village is enclosed by ancient walls and the town retains the original elliptical plan characterized by the main street connecting the two gate towers, the Porta Romana and the Porta Fiorentina. 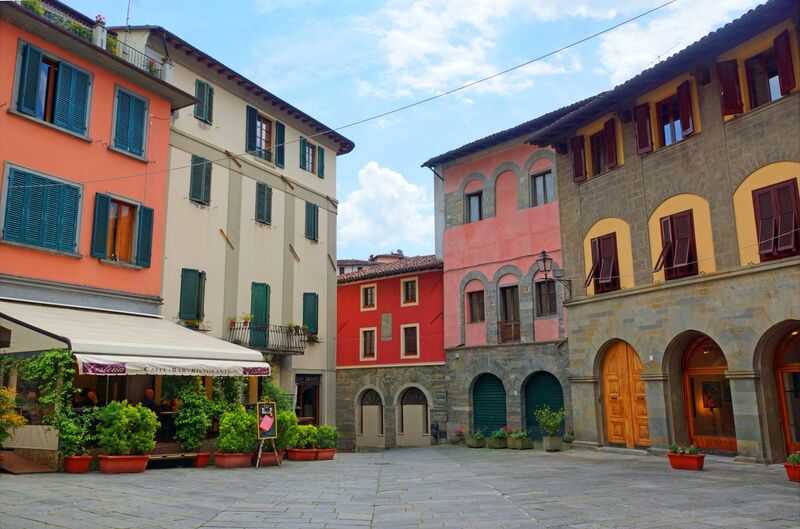 Barga is a must-see if you are going to explore northern Tuscany. This medieval town is a true hidden gem due to its location in the Tuscan-Apennine hills at 410 metres above sea level, dominated by the Pania della Croce, a mountain in the Apuan Alps. Casale Marittimo is worth a visit because this area is home to some incredible natural settings and hidden medieval villages where time seems to have come to a standstill. It is not far from the Tyrrhenian coast and here you’ll fell the clean scent of the sea breeze. This area has been inhabited since Etruscan times. Lari is situated where three hilltops meet in the Pisan hills. The castle looms over the town centre and originally dates back to the Medieval era and most of the present structure dates back to the mid-seventeenth century. Casciana Terme is great spa town where you find relaxing hydrotherapy pools, a pool used for motor rehabilitation, hot tubs with thermal water. Just a short way from the main road between Colle and Volterra, lies the small hamlet of Casole d’Elsa. This is a lively old town featuring a number of shops selling traditional local food products. Castelnuovo Berardenga is located in the southern area of Chianti Classico, not so far from Siena. It was built in 1366 as the stronghold of Siena because of its strategical position on the border of the Sienese land. This small town surrounded by oak forests is not on the usual Tuscan tourist trail but that is a benefit as you can enjoy the peaceful surroundings and experience life in a rural unspoiled Tuscan town. In Castiglion Fiorentino everything is either up or down. The peak is more like a pimple head and everything else is on the side. Located between Arezzo and Cortona, it is renowned for the Etruscan archeological site and for the nine arch loggia, overlooking the valley, constructed by Vasari in 1513. The famous Tuscan writer “Boccaccio”, author of the Decameron and the Life of Dante was born here. Certaldo is a great place to enjoy Tuscan food especially in September/October, during the Boccaccesca Festival. In July, don’t miss “Mercantia”, an international street art festival. Passing through the Val di Chiana you will see a high but rounded, forested mountain called Cetona, and at its foot a town named after it. The houses surround the castle built on the summit of the hill, covered with cypresses and pines. Chiusi is a very small town but it boasts some extraordinary necropolis, the Porsenna’s Labyrinth and the National Archaeological Museum, which houses a real treasure of Etruscan finds and Greek and Roman pottery. The Etruscans of Chiusi made a particular kind of pottery called Bucchero ware that is very dark and imitates metal. The lake of Chiusi (located northeast of the city) is a perfect place for those who love nature and sports. Among the local products, do not forget to taste the olive oil DOP Terre di Siena and wine (Chianti Colli Senesi DOCG, IGT Toscana). From its hillside position, Collodi boasts a magnificent villa and beautiful gardens, one of the most beautiful sights in Italy. Collodi hosts the most important theme park dedicated to Pinocchio and its creator, Carlo Collodi. Cutigliano stands at a height of 678 m above sea level, and some of the most beautiful sights are the town hall, the ancient courthouse, the 15th century church of the Madonna di Piazza and that of St. Bartholomew. Fosdinovo is located about 15 km northwest of Massa and its history has been shaped by the natural position, between the sea and the mountains. Lucignano is a small medieval village overlooking the Valdichiana, halfway between Siena and Arezzo. It is known for the Tree of Love, a true masterpiece of Gothic jewelry decorated with coral, enamel and rock crystal. Massa Marittima is a hidden jewel perched on a hill at just 50 km NNE of Grosseto, Southern Tuscany. Massa Marittima has more resemblances to the towns in Northern Tuscany so it is quite unique in Maremma area. The town rises on a hill clad in olive-groves and vineyards which yield the renowned Brunello wine, between the Ombrone and Asso Valleys. The historic center of Montecarlo is well preserved and it is famous for its wine, for a splendid fortified wall and fortress. On top of a high solitary hill facing Montepulciano, stands this very characteristic medieval village of Tuscany. Far from busy roads and from the usual tourist trail, it is famous for the production of Vin Santo, a traditional Tuscan sweet wine. Montepulciano, just eleven kilometres away, nestled between the Val D’Orcia and Val di Chiana, is the quintessential Tuscan medieval village, boasting a green landscape of rolling hills, castle walls and ramparts, thermal springs and fine wine. Monteriggioni is considered one of the best-preserved medieval towns in Italy and it boasts magnificent exterior walls with fourteen towers on square bases and buildings inside. This ancient town is important both from an architectural and cultural point of view and it has been mentioned in the Inferno of Dante Alighieri’s Divine Commedy. Nowadays it is also famous for “Monteriggioni di torri si corona”, one of the most scenic medieval festival held in Tuscany. Murlo is located in the municipality of Siena and is about 70 km south of Florence and about 20 kilometres south of Siena. The old town is intact, harmonious and well-conserved. This town has a typically Medieval appearance with narrow streets and central piazza which is home to the Romanesque church of San Verano. This town is a UNESCO World Heritage Site and is considered the “capital” of pecorino cheese, because of its high quality due to the fact that the cheese is made from an especially aromatic milk thanks to sheep pastures in the Val d’Orcia area. Pitigliano has been built in the tuff and has a charming Jewish neighborhood. If you visit Pitigliano don’t miss two more tuff-built villages Sovana and Sorano. In the centre of Val di Cecina this enchanting little village houses the power plant of Larderello. Radda in Chianti is a typical Tuscan town, boasting a medieval, hilltop city centre, a bell tower that dominates the underlying valley, roads and alleyways and a beautifully cultivated countryside, where Chianti Classico is made. Radicofani is a small village settled on the via Francigena, the old pilgrim road running from France to Rome. The Rocca di Radicofani is towering from the top of a hill since the XI century and dominates the surrounding territory of the Val d’Orcia, Monte Cetona and Monte Amiata. San Casciano dei Bagni dates back to the Etruscan-Roman period and it takes its name from the famous thermal springs. Santa Fiora is a small and charming medieval village in the Mount Amiata, where stone walls, alleys, small churches and original buildings have been well preserved. Here you can see the old seat of local government called Palazzo Sforza Cesarini, the medieval clock tower (“Torre dell’Orologio”), the Parish of St. Flora and St. Lucilla, the most important and famous of the town’s monuments. San Gimignano, called the “Manhattan of the Middle Ages” for its tall towers, is famous all over the world and is a UNESCO site because it “represent a masterpiece of human creative genius”. Sarteano is a charming medieval hamlet located between the Val d’Orcia and Valdichiana area. It has been inhabited since ancient times and it boasts one of the most important Etruscan tombs in Tuscany. Sorano is a town suspended in time, built on a high rock and this extremely picturesque position captivates all who visit it. Here the Etruscans build a majestic necropolis. Suvereto is a small village, which dates back to the year 1000. Situated on the slopes of the hills overlooking the Costa degli Etruschi, it is a true jewel, rich in history and art, set in the green valley of the River Cornia. Trequanda stands on a hilltop, immersed in a natural environment of woodland and well-ordered vineyards and olive groves. This mediaeval village is in one of the most unspoiled areas around Siena. In Vinci, everything is about Leonardo: the native house, the church where he was baptized, the museum and the library dedicated to him, even the landscape, still intact, which Leonardo himself had contemplated daily. 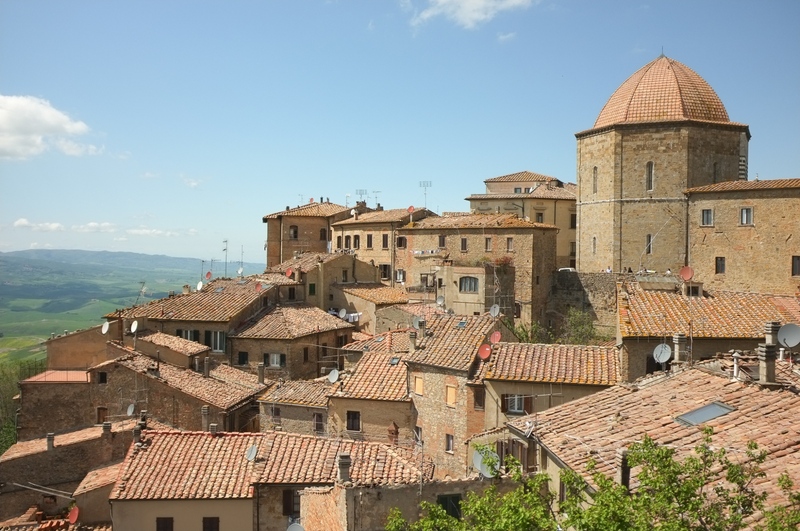 Volterra, a romantic city that offers visitors a glimpse of its typically medieval character, is full of squares, palaces and towers with a romantic movie-like feel. This mysterious hamlet allows you to take a step back in time and proved the perfect setting for the ‘New Moon’ (Twilight Saga). Cancellation Insurance: don’t take any risk!